From heart-warming makeovers to jaw-dropping transformations, Ella Parrie's @ellaschair page has it all. We love following this California-based stylist for so many reasons, check out why she snagged a spot on our 2017 MODERN SALON 100. Most viral post: Ms. Elizabeth is on her last days and suffers from dementia, but she is living each day to their fullest. 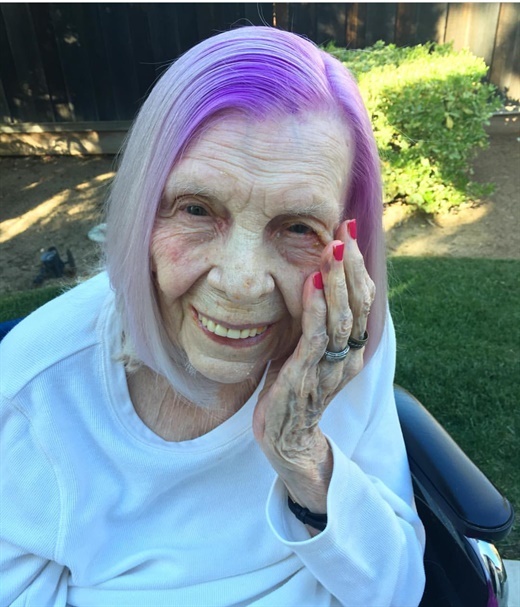 At 92, Ms. Elizabeth had never colored her hair and saw one of my guests with magenta roots that works at her care center and loved it; so she insisted on getting purple roots! One of Parrie's most viral Instagram posts. Pro tip: Post relevant pictures that relate to your business, and get creative with the presentation of the work being shared to grab attention. Posting at your highest tra c times are vital to getting more interaction. Interacting with followers through comments will push your post more quickly to the top of the feed; and can make or break a post. Utilize hashtags and tags, but don’t constantly hashtag the same tags over and over again; try customizing the hashtags to the post. How social media changed my life: I built a solid clientele a year out of beauty school, which would have been much slower without social media. I have not only been able to connect with phenomenal stylists all over the world, but I have been able to help provide for my family.